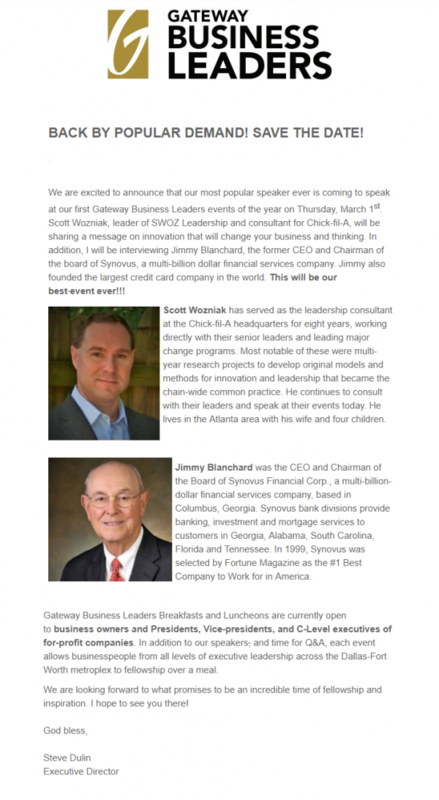 Notice that the last fellow, Jimmy Blanchard, started the largest credit card company in the world. This should make him less than a popular figure around the Gateway ranch since the church has been a big fan of Dave Ramsey’s credit card discouraging financial advice. However, given his influence and large capacity for wealth, he probably has one rather large bullseye on him. Healthy in So Many Different Ways? Not so long ago in January of 2017, Pastor Bobby Bogard was touting the health of Gateway. Now, with the layoffs of about 35% of the staff, he is no longer at the church. 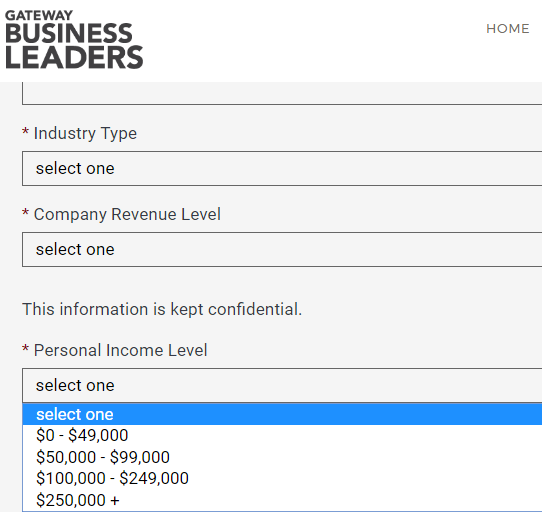 As a reminder of the rationale for the Gateway Business Leaders program, here is Bogard talking about Gateway’s “grace lane” to the rich and influential. 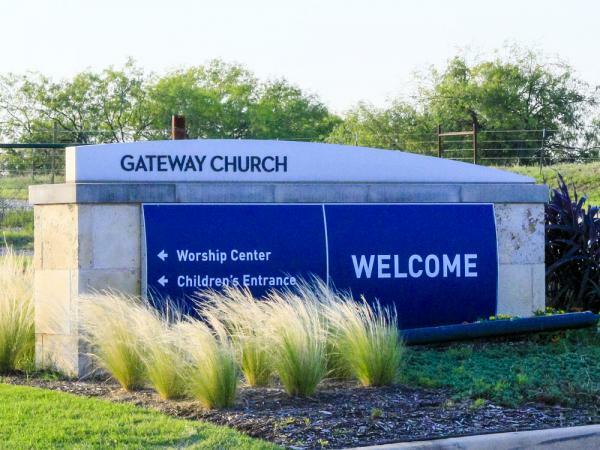 Gateway Church will be 17 years old this Easter. We’re a spirit filled Charismatic church without the weird or the goofy. I’ve seen the weird and the goofy, believe me in my charismania days. Um, we have over 30 thousand in attendance on a weekly basis. That’s six campuses, with 26 services. I say all that to say this, big is not always better. Big is not better. 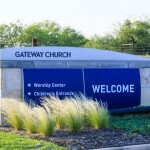 But what we are at Gateway Church is we’re healthy and I wanna talk to you about healthy church. We’re healthy in so many different ways. And health is probably one of the main ingredients of our success. In all of the growth that we’ve taken place we’ve remained a healthy organization and a healthy church. A healthy ministry. A healthy people. A healthy staff. Healthy pace. And so, part of our secret sauce is that we’re healthy. Our goal is to become healthy, not to fill buildings with people. Because here’s the deal. If we can become healthy, we will see people filled with God, and then the principle of ‘healthy things grow’ right? So that’s a value that we hold. Healthy things grow. And so church growth is really a byproduct of a healthy church. Number two is people. We’re all about people. That’s our slogan, it’s been our slogan from the very beginning. I’m gonna drill down to some of this in just a minute. I wanna fly by on a 30,000 foot view, okay? But, we’r e all about people. And the reason we’re all about people is because God’s all about people. Am I right? And so if we’re all about people because God’s all about people, it’s because we know God loves people, and if God loves people we need to love people. But how many of you know, sometimes, in our journey we love Jesus with all of our heart. Right? It’s just some of the people He hangs out with that we have a problem. C’mon somebody? And so, God loves people. I love what Johnny shared, man. I love the fact that John Maxwell is passionate about a million souls, because souls are people. People have problems. People have issues. People have transition. But God loves them in every season of their life. He never turns himself away from people. And so, if you help people, God will send you more people, because God loves people. I’ll say that again. If you love people and you help people, God will send you more people. Why? Because God loves people. And so as we, as we, look at health, and as we look at people, there are some considerations that we go after in preparing ourselves to be healthy and to love people. And that’s number one is: We’re always asking ourself, who is are target? Who’s our bullseye? Do you know who your bullseye is? Your bullseye, not that you’re not gonna reach all people, because we’re gonna reach all people. We’re gonna be all things to all people, to reach all people. But there’s something that God has gifted you with. There’s a Grace Lane that you have. And that Grace Lane is directed to a bullseye. And who is your bullseye? Who are the people God’s called you to reach? And so, as we look at our bullseye, God has called us, to reach professional people. That’s our bullseye. We’re still gonna help the down and out. We do it every week. We’re still gonna help single moms. We do it every week. We-we’re still going to uh, look and help marriages and blended families. We’re gonna work through their issues. But our bullseye is the business professionals. Matter fact, in one of our depart- we have a whole department that’s built towards reaching business people. I’m talking about people with influence and large capacities of wealth. That’s our bullseye because we feel like that’s something God’s graced us to do. And if we can reach our bullseye, it will create a ripple, if you will, so that we can reach the others more effectively. The Gateway Business Leaders Program is a comprehensive program designed to help you accomplish God’s calling and destiny on your life. We have identified numerous topics that we believe will help you achieve Biblical success in your business, personal and spiritual life. We have organized the GBL Program by levels based on background and experience of the members. Our goal is to provide the best resources and relationships to each business leader in our events, training, groups, and mentoring pillars. However, this interesting program isn’t for everyone. In fact, it is quite exclusive. Our heart is to serve every businessperson at Gateway. However, at the present time, to best steward our resources, we have designed programs for business owners, presidents, vice presidents, CEO’s, and other C-level executives. Our program is not currently intended for non-profit leaders, first-time start-up entrepreneurs, direct sales agents, network marketers, manufacturing sales representatives, and realtors working for franchise real estate organizations. If you are an eligible candidate, we invite you to apply. Business Owners: A business owner is defined as someone who owns a majority interest in the business they lead. Corporate Leaders: Corporate Leaders are defined as Presidents, C-Level Executives of private and public corporations that have more than 100 employees, and Vice Presidents that oversee at least 50 employees. Our program is not intended at this time for non-profit leaders, first-time start-up entrepreneurs, direct sales agents, network marketers, manufacturing sales representatives, and realtors working for franchise real estate organizations. As a part of the process, applicants must disclose their salary. Why would a ministry need to know a member’s salary? This is an especially fair question since the leaders of Gateway are secretive about the salaries of senior pastors. Given the recent news out of Gateway, I am not sure I would want to join. “Come learn how we cut staff by one-third and cut pay by as much as 20%” isn’t an attractive slogan. Note: Gateway executives could not join Gateway’s program. Since Gateway pastors are leaders in a non-profit organization, they would not be eligible to join the group they are leading. In essence, GBL seems like an exclusive club for Christian high rollers, one which is financed by rank and file donors.